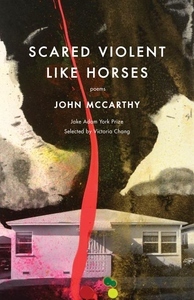 Selected by Victoria Chang as winner of the Jake Adam York Prize, John McCarthy's Scared Violent Like Horses is a deeply personal examination of violent masculinity, driven by a yearning for more compassionate ways of being. McCarthy's flyover country is populated by a family strangled by silence: a father drunk and mute in the passenger seat, a mother sinking into bed like a dish at the bottom of a sink, and a boy whose friends play punch-for-punch for fun. He shows us a boy struggling to understand "how we deny each other, daily, so many chances to care" and how "we didn't know how to talk about loss, / so we made each other lose." Constant throughout is the brutality of the Midwestern landscape that, like the people who inhabit it, turns out to be beautiful in its vulnerability: sedgegrass littered with plastic bags floating like ghosts, dilapidated houses with abandoned Fisher Price toys in the yard, and silos of dirt and rust under a sky that struggles to remember the ground below. With arresting lyricism and humility, Scared Violent Like Horses attends to the insecurities that hide at the heart of what's been turned harsh, offering a smoldering but redemptive and tender view of the lost, looked over, and forgotten.